Below is a press release just received from Babcock & Wilcox. (CHARLOTTE, N.C. – February 27, 2013) – Based on the significant amount of misinformation contained in its press release and presented in today’s press conference, Taxpayers for Common Sense appears to be significantly misinformed on the importance and development of advanced, clean energy technologies for America’s future. 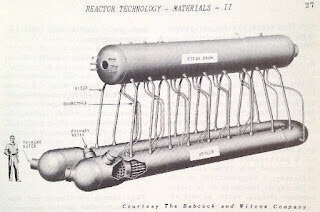 The Babcock & Wilcox Company (B&W) has invested substantial resources in its small modular reactor (SMR) program because we believe in the promise of this technology. The U.S. Department of Energy wisely decided to support SMR development with a cost-share program so that this beneficial technology can be brought to market and new American jobs can be created. Governments throughout the world invest in the development of advanced energy technologies that will deliver cost, safety and environmental benefits to their citizens. In order to maintain the United States’ position as the global leader in this industry, our leaders have for many decades supported promising new ideas that have led to innovations in emissions control technologies, nuclear energy, biofuels, hydro power, wind, natural gas and other areas. Support from the Obama administration and the current Congress has been bipartisan and equally strong because SMRs hold the same potential for game-changing innovation. The development of SMRs will produce new employment opportunities for Americans – with the companies that design them, with manufacturers and companies in the supply chain, with construction firms and with the utilities that own and operate these plants. U.S. investment in SMRs is an investment in jobs for Americans. Taxpayers for Common Sense mistakenly characterizes SMR technology. SMRs are different from naval reactor technology, and in fact will require significant review and approval by the Nuclear Regulatory Commission before they can be built. The B&W mPowerTM reactor is designed to be safe and produce clean energy. Its passive safety systems and secure underground containment make it an attractive, safe option when compared to traditional nuclear reactors. Each module also will provide zero-emission operations, contributing to the reduction of an estimated 57 million metric tons of CO2 during the lifetime of each reactor. And despite Taxpayers for Common Sense’s outrageous claim, SMR power plants are not designed for construction in suburban neighborhoods. In fact, as with any other major facility, communities, local and state governments will have a role in decisions to site these small, safe, efficient reactors. B&W is committed to the development and deployment of SMRs and we’re committed to America’s future as the world leader in clean energy. We’re grateful for the support we’ve received from the U.S. Department of Energy, state and federal government leaders, our project partners and the public for our work. We continue to look for cooperative partnerships and outreach opportunities with those interested in deploying SMRs and we’re excited to do our part to bring this promising new technology to market. ATOMIC POWER REVIEW commentary follows. Yesterday, I (and a number of others) were made aware of the upcoming "media event" that Taxpayers for Common Sense was holding. The release from this organization made it all too clear that nobody involved with the event really understands SMR, or for that matter, nuclear technology. The term SMR is most commonly debated in terms of output -- that is to say, how much energy a power plant develops. However, the real key factor in SMR plants is NOT the output. It's the modular construction - and in the case of most of the light water cooled and moderated designs, this means moving the steam generators and coolant pumps inside the reactor pressure vessel. That design alteration is significant as compared to the reactor plant portions of large commercial nuclear generating stations. This concept of an integral component SMR is neither new nor untested. B&W came up with such an integral design all the way back in 1962. A reactor plant developing 38 MWt and 10,000 shaft horsepower was installed in the German built nuclear powered ore carrier Otto Hahn, which first achieved criticality in 1968. Commercial service with this ship began in 1970. What remains to be seen is how the design makes it through the present-day licensing process. You can find many more details about the B&W / Generation mPower SMR plant by reading the interview I did with Generation mPower's Matt Miles on this site. Click here to see it. Below is a press release from Southern California Edison, regarding the ongoing San Onofre situation. “This question and answer process is an important part of safety-based technical solutions in the nuclear industry, and it strengthens our ability to communicate to all stakeholders the safety principles and proven industry operating experience that the Unit 2 restart plan was built upon,” said Pete Dietrich, senior vice president and chief nuclear officer of SCE. SCE’s independent global experts have already completed several operational assessments for Unit 2. In the RAI 32 response, SCE proposes to supplement those with an additional evaluation by March 15, 2013 to demonstrate that structural integrity can be met for Unit 2 at 100 percent rated thermal power. Even with this supplemental analysis, SCE intends to only operate at 70 percent power for five months before completing another set of thorough inspections. “We are committed to being open and transparent as we move toward safe restart of Unit 2, and we look forward to discussing all our RAI responses with the NRC,” Dietrich said. The NRC will webcast the RAI meeting with SCE on Wednesday, Feb. 27. The NRC’s questions and SCE’s responses to the RAIs will be posted at www.SONGScommunity.com as they become available. It's time for the 145th edition of the Carnival of Nuclear Energy. Every week, the top pro-nuclear bloggers get together and decide which of their weekly posts is most important, and the compilation appears as the traveling Carnival. When the Carnival is here at Atomic Power Review, there's always a catch -- a game I call "What is this?" I present a photo of something, and you try to guess what it is. The answer follows the weekly Carnival entries. So.. What is this? Clearly, this is a massive construction project well underway; the photo blows up very large when clicked, and I'd encourage that just to see the level of detail. What is this? Or, perhaps more to the point, WHERE is it? Hint: This is an early nuclear power plant. Answer after the Carnival... and here we go! APR: Gail Marcus was traveling when I asked for people to share their stories about their favorite nuclear artifacts, so wasn't able to share her stories of getting Glenn Seaborg's signature--twice! She has now posted that story at her own blog, Nuke Power Talk. I hope that this inspires more people to share their memories so we can publish another round of stories sometime in the near future; the original appeared on ANS Nuclear Cafe, and so will the follow-on. General Atomics is calling for game changing new nuclear energy technology. The Energy Multiplier Module, is being developed by General Atomics. The EM2 is a compact fast reactor about 12 meters high, with 265 megawatts electric (MWe) output. The immediate challenge for the reactor is proving out the fuel element, which consists of novel ceramic cladding and fuel that enable the reactor to operate at high temperatures and high power densities. The company is also developing and testing a compact high-speed turbine generator that can achieve efficiencies of more than 50%. Unit 1 of the Hongyanhe plant in Liaoning province in northeast China has been connected to the electricity grid. The reactor is expected to enter commercial operation later this year. The 1080 MWe Chinese-designed pressurized water reactor was connected to the grid at 3.09pm on 17 February. It now enters a phase of commissioning tests, after which it will enter commercial operation. Vermont Yankee has announced that it will refuel again this spring, and also do maintenance and upgrades. The refuel announcement caused shock and consternation among people who believe a recent stock analyst's report. The report claimed that Entergy should and would close some of its nuclear plants, probably starting with closing Vermont Yankee. In her post, Meredith Angwin links to a radio interview, a week ago, in which she publicly disagreed with the analyst's conclusions. In other words, a week ago, she told you so. The news this past week of tanks leaking at the Hanford Reservation has moved to the headlines in many places. Jim Conca provided information to the Tri-City Herald on the matter. It looks like moving some of the material to WIPP is on the table; see the link for more details. After the recently announced Kewaunee nuclear plant closure, some experts are saying that some other nuclear plants may too be at risk. Jim Hopf with an in-depth analysis that explains how unfortunate, shortsighted, and frankly, dangerous this development would be, and an exploration of options to prevent it. Yes, the Mars rover Curiosity is incredible -- and fellow plutonium-powered Cassini, currently orbiting Saturn, has made possible many equally amazing scientific discoveries. The best may be yet to come. In a beautifully written and illustrated chronology, Stan Tackett provides a history of the achievements and discoveries of the nuclear-powered Cassini-Huygens mission to Saturn. Does Obama Prefer Gas Over Nuclear? Romance of Radium – How did our relationship with radioactive material sour? Rod Adams discusses the experience of watching Romance of Radium, a 1937 short film about the wonders of radium and the reason why it was valued at $750,000 per ounce - in 1937 vintage dollars. Seen through the lens of today's pervasive radiation phobia, the film illustrates how society's perceptions have changed - even though reality remains constant. "Out of the darkness of the past comes a white light of hope for today, radium, the most precious substance in the world. Centuries from now it will still shine upon some future civilization, saving through the ages countless thousands of human lives." It seems Tokyo is content to continue throwing away big bucks in the desire to soothe the radiation fears of a numerically-significant minority in the population. Tokyo is decontaminating homes as far away as 200 kilometers from F. Daiichi that have detectible Cesium levels. Deconning most of these 103,000 homes will make them no safer than without the expensive cleansing. Tokyo should shift the funding from this politically-expedient boondoggle and put it where it is reallyneeded – the reconstruction of the Tohoku communities forever lost to the 3/11/11 tsunami. Japanese researcher Kazuo Sakai said,“Since the accident in Fukushima, no health effects from radiation have been observed." But Greenpeace calls this a government ploy and says Japan should carry out frequent health checks all over Japan "even if there is no comparative epidemiological data" to support it. The Japanese constitution says the public has a right the right to live in peace, free from fear. Greenpeace’s fear-mongering is a moral crime against the people of Japan. Everyone should have a look at the exciting fact-finding and information sharing trip Suzanne Hobbs Baker is conducting in Europe; see the results at the "Diary of a Nuclear Tourist" blog updated as her time and schedule permit. Lots to see, lots to learn - and we're all along for the trip via the interwebs! A recent Motley Fool article on Nuclear Myths prods commentary by Mark Flanagan. Mark Flanagan makes a follow-up post to that linked above, detailing the overselling of sentiment, either pro-nuclear or anti-nuclear. That's it for this week's Carnival entries. Now, to identify that photo you saw above and give some further background. The photo at the top of this entry is taken from a 1959 Vitro Engineering Company advertisement showing the Indian Point Station under construction. Vitro, calling itself "Engineers to the Atomic Age," says in part "The latest - and one of the most significant ... landmarks is a great nuclear power station now rising at Indian Point on the Hudson River. Beginning in 1961, this Indian Point station will produce 275,000 kilowatts of electricity." Vitro Engineering served as architect-engineer; the reactor vendor was Babcock & Wilcox, and the owner Consolidated Edison. The plant was completely privately financed. The photo you have seen was taken from the river side of the plant, looking up and over the construction of the turbine building in progress. 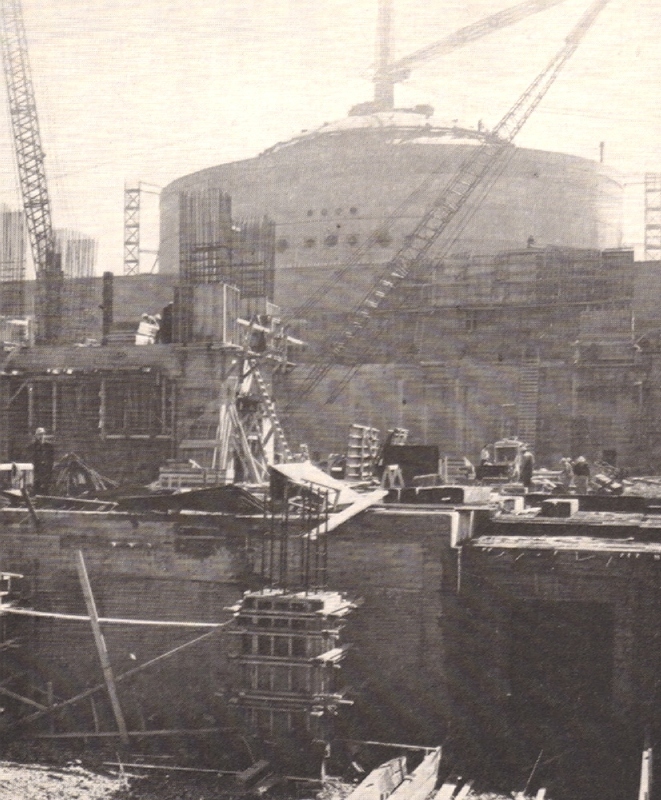 The reactor building, actually comprising an internal 160 foot diameter vapor containment sphere and concrete outer shield building, rises above and behind - and various penetrations of the shield building to carry piping and wiring to the plant can be seen. The project was issued AEC Construction Permit CPPR-1 on May 4, 1956. 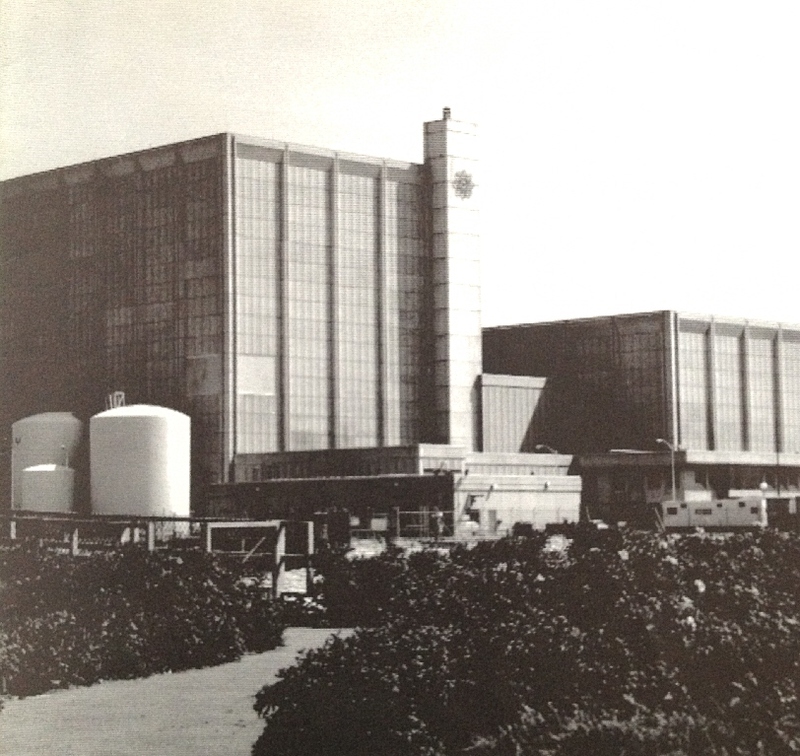 Site work began at the end of that year, but heavy construction of the plant began in 1958. Initial criticality was originally scheduled for April 1961 but wasn't achieved until August 2, 1962; the plant generated its first electricity September 16, 1962. Indian Point, which of course later became known as "Indian Point 1" because later on two further units of wholly different design were built on site, was and is peculiar among nuclear power plants for a variety of reasons, some of which we'll see now. Above is a view of the entire powerplant; click to enlarge. 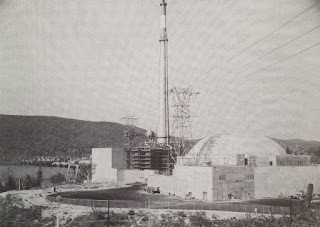 The unique structure of the reactor building is obvious; the 160 foot sphere, designed for 25 psi max internal pressure and 1 psi max external pressure, is surrounded by concrete walls 5-1/2 feet thick, topped by a 2 ft. 9 in. thick concrete dome. Moving to the right, we see a set of two oil-fired superheaters interposed between the reactor service building and the turbine building. Very few nuclear plants used fossil fired superheat to supplement a nuclear plant; included in this list were Indian Point 1, Elk River and the Carolinas-Virginia Tube Reactor. Completing the plant are the turbine building, electric switchgear and pump houses. The first core used in Indian Point was an enriched uranium / thorium converter design rated 585 MWt. The plant's net output as first operated was 255 MWe; of that, 104 MW derived from energy inserted into the cycle by the oil fired superheaters. 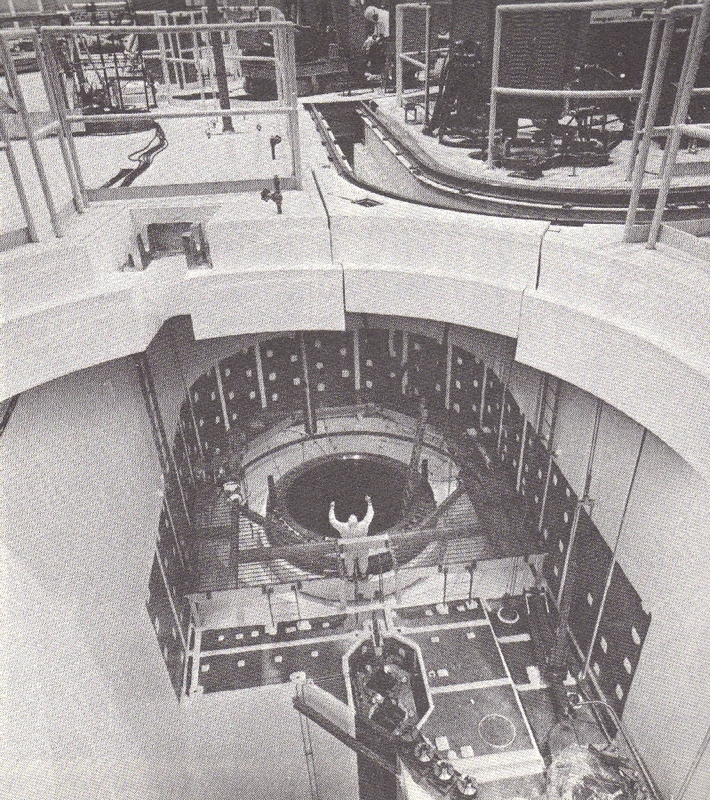 A second core, uranium only, was installed during the last quarter of 1965 and the first quarter of 1966; with this and the third core, installed in early 1969, the reactor was rated 615 MWt, giving a plant output of 285 MWe gross and 265 MWe net. 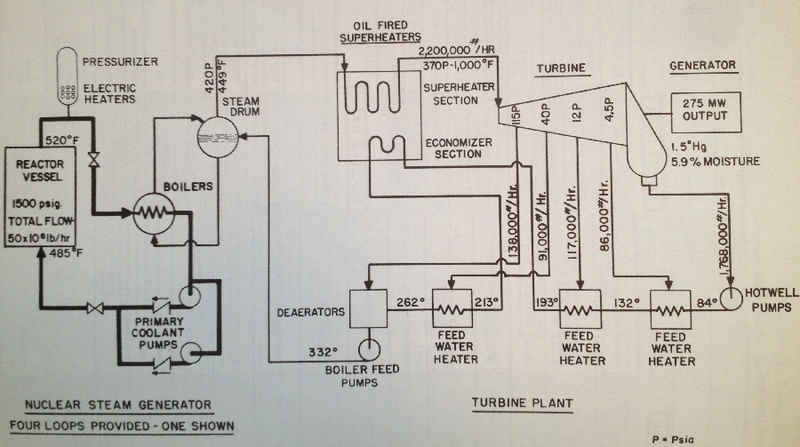 Below is a photo of the system diagram for Indian Point as reproduced in "Power Reactors 1959" published by the ASME. Click to enlarge. 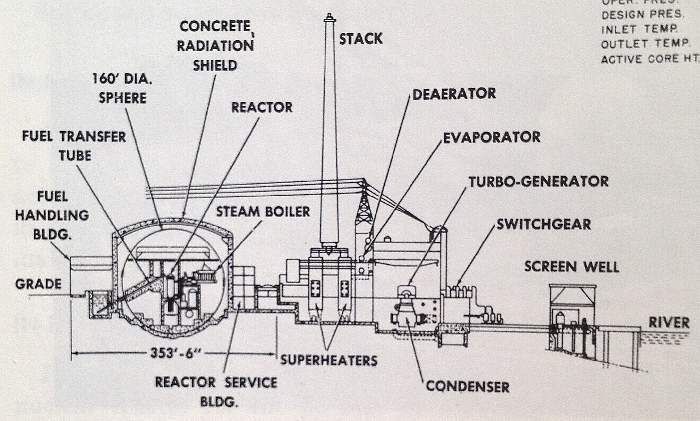 The nuclear plant had four loops, each including a steam generator as shown above. These are similar to the units Babcock & Wilcox supplied for two of the four loops at the Shippingport Atomic Power Station. Let's take a look at a number of other early photos of the plant under construction and just after completion. 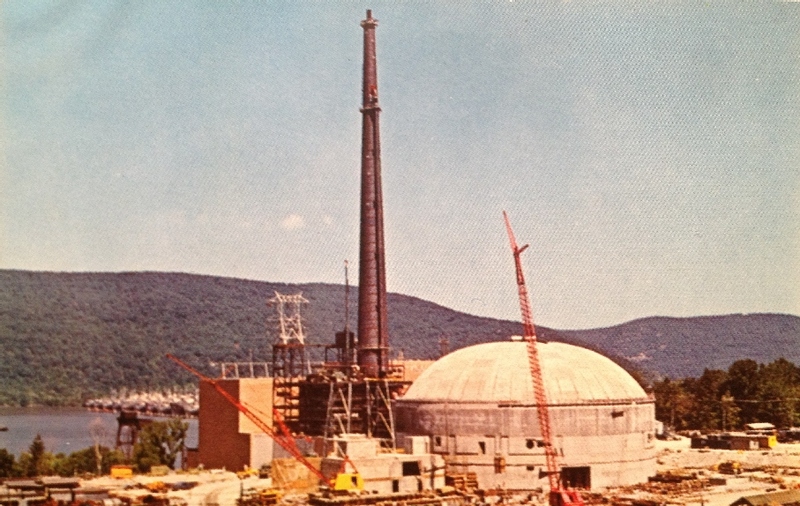 Here is an early color post card view of Indian Point under construction. In this view, the reactor building and turbine building are complete. The size of the cranes can be used to judge overall scale. Here is a slightly later photo from the Atomic Energy Deskbook, showing the plant nearing completion. The additional buildings around the reactor building are obvious, as is the finished nature of the site immediately around the plant. Above, a photo from "Steam: Its Generation and Use" by Babcock & Wilcox, showing the completed power station as it appeared in 1963. Above, a photo taken from the extremely obscure "Nuclear Engineering Technology" correspondence course published by CREI Atomics. (Large photo when clicked.) 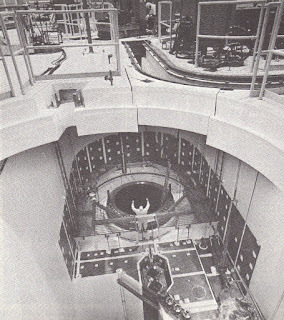 Caption: "View of operating floor, top of reactor pressure vessel, and reactor component storage pool at Indian Point (New York) power plant. Before fuel is loaded, the position of each of 120 fuel elements and the reactor internals is carefully indexed for reference by operators of remote control equipment (shown at top of picture.) A man standing at the top of the open reactor pressure vessel signals to the operator 23 feet above him to indicate the proper positioning of a dummy fuel element. At the lower right, covered with plastic, is the hatch through which basket containing real fuel elements is brought by remote control from fuel storage building." Below, a magnificent view of the completed Indian Point Station when new. 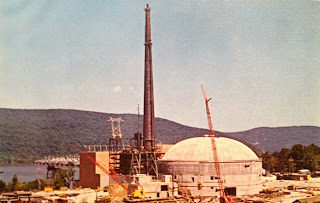 Indian Point 1 was shut down on October 31, 1974 due to the fact that its emergency core cooling system did not meet the existing (newer) requirements. 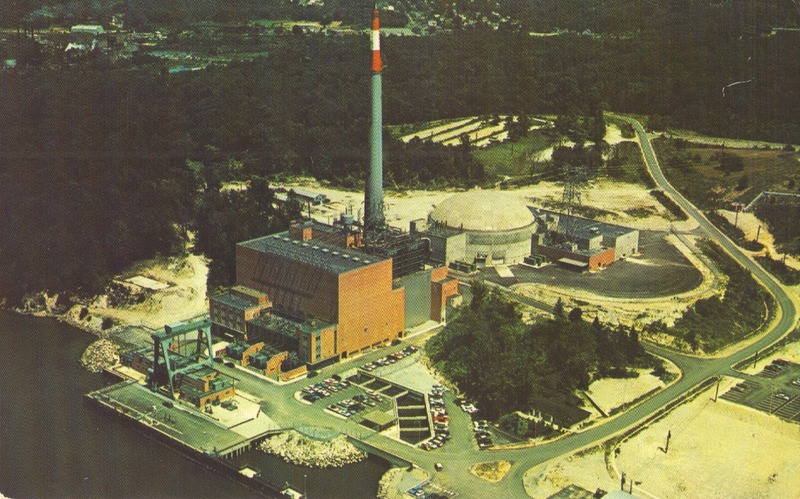 In 1975, Consolidated Edison defueled the reactor. 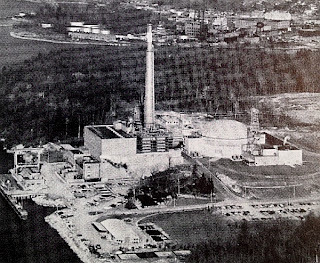 In 1980, the NRC requested Consolidated Edison show why the operating license for the plant should not be revoked; with consent of Con-Ed, the operating license was revoked June 19, 1980 and plans were made for the decommissioning of the plant - which by that time had been joined by Indian Point 2 and 3. Indian Point 1 remains today in SAFSTOR condition, and will not fully decommission until Indian Point 2's license expires and that plant is also shut down. You can visit two official sites covering today's Indian Point nuclear station. Click here for the Entergy Nuclear page covering the site, or click here for the big Indian Point Energy Center site. I hope you've enjoyed the 145th Carnival entries, and a look back at one of our earliest commercial nuclear power stations. Sources: "The Atomic Energy Deskbook," John F. Hogerton - Reinhold 1963; NRC Information Digest 2012-2013 and US NRC website; "Nuclear Engineering Technology", CREI Atomics; "Nuclear Reactor Plant Data, Volume 1- Power Reactors," May 1959 ASME; "Nucleonics," May 1959; "Operating History - US Nuclear Power Reactors" WASH-1203-73, US AEC 1973; "Steam / its Generation and Use," 38th ed. Babcock & Wilcox 1975. Also, post cards in Will Davis collection. BWR = Boiling Water Reactor. PWR= Pressurized Water Reactor. PHWR = Pressurized Heavy Water Reactor. 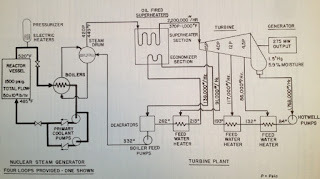 HTGR = High Temperature Gas-cooled Reactor. It's time to point out a few of the added links here on Atomic Power Review. I frequently add links to two places on this site as I find them - the side bar, and the Fukushima Accident Reports page. Numerous links have been added since the last time I wrote about them. The other Fukushima related link is the most recent (fourth) physical integrity inspection of the 1F4 reactor building by TEPCO. This document is from 13 February, so is the newest assessment of the situation at this building available. Click here to access my Fukushima Accident Reports page. This link can always be found on the right sidebar under the header "Pages On This Site." MAIN SIDEBAR - I've added several types, or groups, of links lately. Also included are links to the Russian VVER plant types -- generally referred to as VVER-1000, VVER-1200 (a.k.a. AES-2006) and an interesting link labeled MIR-1200 that covers co-operative Russian projects. These sites give photos of the bases as they appeared while in full operation, when essentially run down and abandoned, and then glimpses of the complete obliteration of the bases which are now entirely replaced by high-end housing developments. If you are unlucky enough not to have retained your copy of the Rudder from Basic Training, then you will definitely want to see these photos if you've wanted to look back. I added these because I've realized that practially all of the physical aspects of my Navy experience -- that is, RTC and NTC Orlando, the Charleston Navy Base, and my ship, USS Simon Bolivar SSBN-641 are all gone. The only location that I was assigned which is still operating is NPTU Ballston Spa, which really is the Navy unit for training at KAPL's Kesselring Site in West Milton, New York. For those reasons, finding the above sites was all the more special to me and it's nice to see that at least a few people took the time out to document the Navy presence in Orlando before it was gone. As I've mentioned, I'm constantly looking for informative and useful links to add to Atomic Power Review to ensure it's a solid resource and that it's kept timely. Feel free to e-mail me with any ideas about other links to add! This week, we have a great sort of follow on to that older video. Kirsty Gogan Alexander, Head of Communications of the Nuclear Industry Association (which is a UK affair, not a US affair) gave a presentation at an Institution of Civil Engineers event making the case for nuclear energy very strongly. While the event was in England, it's important to note that very many of the points she made (clearly and effectively, I might add) apply quite generally to nuclear energy world-wide. You can click here to see the entire presentation; Kirsty is the lead speaker. You can also follow her on Twitter, where she's found as @kirstygogan. The Nuclear Industry Association's site has been linked from the sidebar of this site for some time. To round out this update, Southern California Edison has made a new, short video detailing the importance of San Onofre Nuclear Generating Station to the overall grid stability and reliability in southern California. This is important to see - many folks clamoring for shutdown of nuclear plants might not have realized some of the truths about electric distribution which are revealed in this video. Click here to see it. Over the weekend, Pilgrim Nuclear Power Station experienced what is referred to as a LOOP or Loss Of Offsite Power event and shut down. Many people and websites have questioned the events and/or safety of the plant. I'll describe what occurred, and include NRC Event Reports to help detail the situation. Above, illustration of Pilgrim Station from Boston Edison brochure "About Pilgrim," 4/81. Pilgrim was ordered by Boston Edison in 1965. The plant was designed and built by Bechtel Corporation; construction began in late 1967, with initial criticality June 16, 1972 and first electric power generated July 19, 1972. The plant was declared commercial on December 9, 1972. What actually happened was that storm-related damage to the electric distribution grid suddenly caused the plant to have nowhere to send the electric power it was generating, and of course get no outside power for any plant services to power anything. The result was a trip of the turbine generator, a reactor trip (scram) and shutdown of the plant. The EDG's or Emergency Diesel Generators started automatically to provide power. Because of the LOOP event, the facility is required to declare "Notification Of Unusual Event." This happened when the grid connection was lost; the situation was rectified, but then further storm related events caused the plant to lose power connection to the outside again and a second LOOP event occurred. It's important to note that the shutdown of the plant went as designed, and that the reactor is safely in cold shutdown. Time and again, this is the chain of events - even though the anti-nuclear web pages continue to predict disaster at U.S. nuclear plants related to weather, the plants consistently operate safely even in the very worst possible weather, including flooding, tornadoes, hurricanes and blizzards. There have also been earthquakes. Look here for a great history compiled by NEI showing some of the serious weather events that U.S. nuclear plants have made it through over the years. Entergy's Pilgrim Power Plant site is active, and their Pilgrim account on Twitter has re-awakened; you can find them on Twitter using the handle @PilgrimNuclear. Some people in the pro-nuclear world have asked if such a series of events that happened this weekend should be emphasized -- in other words, are they really newsworthy? Until the public finally realizes that nuclear power plants have historically weathered every single major environmental catastrophe in the United States without serious incident, perhaps such events are news. Eventually people will tire of getting all worked up over nothing and stop auguring disaster when severe weather events arrive. How can they do that? They can do that because of the incredibly competent people who operate, maintain, supervise and (via NRC) regulate the nuclear plants. This is not to say that the public has no stake, and no say; it is to say that the level of hyberbolic concern is not justified. Until that time, those of us who report on such things will have to keep reporting and communicating clearly, honestly, and frequently. Below, for completeness, I'll reproduce the text of the two Event Notifications that are presently available from the NRC. If you read through these, you'll see the actual events and times, and that the plant and staff have responded admirably. "Pilgrim Station scrammed on a loss of offsite power. All systems performed as designed. Groups I, II, VI went to completion. Reactor Core Isolation Cooling (RCIC) is injecting to the vessel controlling level. High Pressure Coolant Injection is in pressure control and slowly cooling down. Offsite power was lost multiple times. The Startup Transformer has been declared inoperable. The Unusual Event was declared under EAL SU 1.1 based on loss of offsite power greater than 15 minutes [at 2200 EST]." The licensee originally experienced an automatic reactor scram at 2117 EST due to a load reject with a turbine trip/reactor scram due to loss of power. Offsite power availability has been fluctuating in and out to the site. The licensee states that all systems are functioning as required. 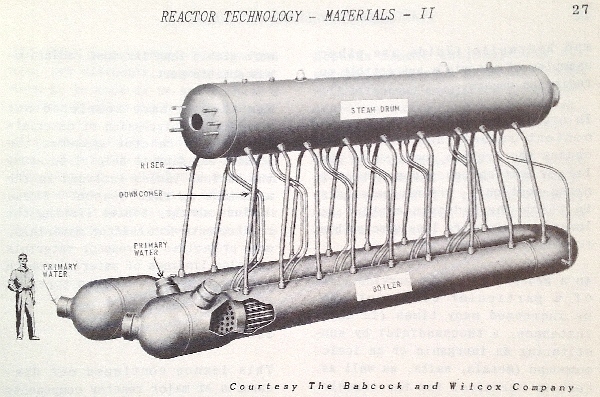 All rods fully inserted and the reactor is stable in Mode 3. Both Emergency Diesel Generators are providing power to the safety related buses. The loss of offsite power is believed to be weather related. The licensee has notified the State and local authorities and the NRC Resident Inspector. Notified DHS SWO, FEMA, USDA, HHS, DOE, DHS NICC, EPA, and NuclearSSA via email. Pilgrim terminated the Unusual Event and has transitioned to recovery effective at 10:55 AM on 02/10/2013. Offsite power has been restored to safety-related and non-safety-related electrical buses through the station Startup Transformer via a single 345 KV line. The other two offsite power sources remain out of service. The emergency diesel generators have been secured and are in standby. Residual heat removal is in shutdown cooling mode maintaining the reactor in cold shutdown. Fuel Pool Cooling is in service with fuel pool coolant temperatures trending down. The licensee notified State, local authorities and the NRC Resident Inspector. Notified R1 RA (Dean), R1DO (Powell), NRR DIR(Leeds) NRR EO (Evans) and NSIR IRD (Marshall). "On Sunday, February 10, 2013 at 1405 [EST], with the reactor at 0% core thermal power, all control rods fully inserted, and in cold shutdown conditions, the plant experienced a loss of off-site power. With Pilgrim Station aligned to off-site power via the start-up transformer (SUT), a fault on the 'B' phase of the SUT was experienced due to suspected falling ice striking the phase's insulator. This resulted in the tripping of the feeder breaker, ACB-102, and the loss of power to 4160 KV buses A1 through A4. Emergency Diesel Generators (EDGs) 'A' and 'B' auto-started as designed and are powering emergency buses. "The loss of off-site power resulted in de-energization of both Reactor Protection System (RPS) channels resulting in a reactor scram signal and isolation of shutdown cooling. At 1418, shutdown cooling was returned to service. All other plant systems responded as designed. Station personnel are in the process of establishing back-up power in accordance with plant procedures. As always, you can keep up with the latest by following Atomic Power Review on Twitter - look for me there using the handle @atomicnews for updates on all things nuclear. ROSEMEAD, Calif., Feb. 7, 2013—Southern California Edison (SCE) shared its analysis of the causes of steam generator tube wear at the San Onofre Nuclear Generating Station today at a Nuclear Regulatory Commission (NRC) meeting on industry steam generator tube wear issues. The presentation to the NRC reviewed the extensive analysis by SCE and its independent global experts of causes of tube wear in San Onofre Unit 3 and the corrective actions to eliminate those causes in Unit 2. “After extensive analysis from three independent experts, we are confident that we understand the causes of the tube wear and have taken the appropriate steps to prevent it in Unit 2,” said Pete Dietrich, SCE senior vice president and chief nuclear officer. During the NRC meeting in Rockville, Md, other nuclear industry vendors and the Electric Power Research Institute also made presentations on steam generator issues. SCE determined the tube-to-tube wear in the Unit 3 steam generators was caused by a phenomenon known as fluid elastic instability. This phenomenon stems from three factors: high steam velocity, low-moisture conditions in specific locations of the tube bundles, and ineffective tube supports in the same locations. SCE has proposed operating Unit 2 at 70 percent to decrease velocity, increase damping and prevent fluid elastic instability. More information is available at www.edison.com/SONGSupdate and at www.SONGScommunity.com. San Onofre is jointly owned by SCE (78.21 percent), San Diego Gas & Electric (20 percent) and the city of Riverside (1.79 percent). Follow us on Twitter (www.twitter.com/SCE) and like us on Facebook (www.facebook.com/SCE). The U.S. Nuclear Regulatory Commission Region I staff is monitoring the Pilgrim nuclear power plant after the site lost offsite power Friday evening. 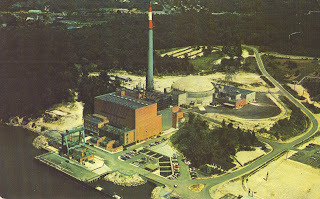 The plant is operated by Entergy Nuclear and is located in Plymouth, Mass. Pilgrim automatically shut down after losing offsite power at 9:17 Friday night (2/8). The plant is stable and all plant safety systems responded as designed. The plant's diesel generators are currently supplying power to plant equipment. Plant operators declared an unusual event due to the loss of all off-site power. An Unusual Event is the lowest of four levels of the NRC’s emergency classification system. There was no impact to plant workers or the public. Pilgrim did not scram out from full power, as the plant had been operating at a reduced power level to negate problems with a simmering relief valve. The last data point shown by NRC for Pilgrim had the plant at 83% power. If any updates are required, I'll make them here or on Twitter -- ' @atomicnews '. Click here for an excellent NEI piece on the history of US nuclear plants' response to severe weather. Briefly, for FANC (the Belgian nuclear regulator) has not made an official release on the web yet, it has been reported several places today (such as here) that FANC has approved the GDF plan for testing submitted in response to FANC requests. Once these tests are complete, the present "Provisional Evaluation Report" on the Doel Unit 3 and Tihange Unit 2 will be replaced by a "Final Evaluation Report," to contain the final decision on whether or not to permit power operation of the reactors. The retest plans were submitted by Electrabel as response to a request for information by FANC on January 15. FANC has made a number of "Requirements" for Electrabel to demonstrate various proofs concerning the vessels and their testing, which according to today's reports could be finished by the end of March. The FANC interim report points out, in terms of how the hydrogen flaking appears in these two vessels made by Rotterdam Dockyard (and apparently appears in none others made by that firm) that the "Potential root cause factors among others are a cooling of the ingot to room-temperature before forging (as a result of the transport of the ingot from Krupp to RDM) or an inadequate heat treatment." The statement has already been made by FANC that nothing it has seen so far indicates that permanent shutdown of these reactors is warranted. Assuming that Electrabel properly and completely meets the testing requirements (which include a fair number of further observations and tests for maximum safety assurances) there is no reason why these plants cannot be back in service before mid-year. Atomic Power Review has reported on this story as recently as February 4; see link for details and background. It has now become fairly widely reported that Senator Barbara Boxer (D) and Representative Ed Markey (D) have written a letter to the NRC supposedly containing "smoking gun" information from a leaked (i.e., non-public) Mitsubishi report. How they got this report remains open to question. In response, Southern California Edison has sent out two press releases, which follow in the order of their dates. To my way of thinking, the second is far more important; both are here for completeness. My comment and a couple of links follow. ROSEMEAD, Calif., Feb. 6, 2013 — Southern California Edison (SCE) is aware of the letter dated today by Sen. Barbara Boxer and Rep. Ed Markey to the Nuclear Regulatory Commission (NRC). SCE is fully cooperating with the NRC review process and is complying with all requests for information and documents related to the company’s San Onofre Nuclear Generating Station. SCE leadership takes very seriously all allegations raised by the letter. The plant has provided voluminous records, data, information and other accurate reports as requested in the months since the plant was safely shut down. SCE will continue its own internal work and we respect the NRC's inspection process. SCE is strongly committed to the transparent review of its operations at San Onofre and the safety of the public and its employees. The plant’s Unit 2 was taken out of service Jan. 9, 2012, for a planned outage. Unit 3 was safely taken offline Jan. 31, 2012, after station operators detected a small leak in a steam generator tube. Each unit will remain shut down until the NRC is satisfied that the unit is safe to operate. For more on the plant, please visit www.SONGScommunity.com, or follow us on Twitter at www.twitter.com/SCE_SONGS and on www.facebook.com/SCE. ROSEMEAD, Calif., Feb. 7, 2013 — The Feb. 6 letter to the Chairman of the Nuclear Regulatory Commission (NRC) from Sen. Barbara Boxer and Rep. Ed Markey quotes portions of two sentences from a lengthy technical report that was prepared by Mitsubishi Heavy Industries (MHI), not Southern California Edison (SCE). The report was submitted to the NRC by MHI months ago as part of the voluminous records, data, information and other materials the NRC has been thoroughly reviewing and inspecting as part of its consideration of SCE’s request to restart Unit 2 safely. It is simply not accurate to suggest, as the letter does, that when they were installed “SCE and MHI were aware of serious problems with the design of San Onofre nuclear plant’s steam generators.” Indeed, MHI, the manufacturer of the steam generators, warranted the steam generators to be free from defects for 20 years after installation. SCE would never, and did not, install steam generators that it believed would not perform safely. SCE, like other utilities seeking to replace its steam generators, sought to purchase replacement steam generators that would meet or improve upon the safety standards and performance of the original steam generators. SCE’s design specifications followed industry standards for compliance with NRC processes. In fact, SCE submitted two license amendments during the replacement steam generator review process, which the NRC approved. The plant’s unit 2 was taken out of service Jan. 9, 2012, for a planned outage. Unit 3 was safely taken off line Jan. 31, 2012, after station operators detected a small leak in a steam generator tube. Each unit will remain shut down until the NRC is satisfied that the unit is safe to operate. Today, there will be a hearing with all the NRC Commissioners about the ongoing San Onofre issues -- no doubt why this Boxer / Markey letter "appeared" within the last 48 hours. For background on this situation, see this recent APR post with thorough links to a great deal of information. Following the links from this post, you'll see that the NRC fully approved the design changes at San Onofre, and issued license amendments. I myself have read through all of the presentations (even those for today, which were posted several days ago) and still see nothing that tells me that either SCE or Mitsubishi should reasonably have suspected that these steam generators wouldn't work properly when they were installed. Following a comprehensive analysis, Progress Energy Florida, a subsidiary of Duke Energy, announced today that it will retire the Crystal River Nuclear Plant (CR3) in Citrus County, Fla. The plant has been safely shut down and offline since late 2009. The company is reviewing alternatives to replace the power produced by the unit, including the potential construction of a new, state-of-the-art natural gas-fueled plant. The company is evaluating a number of potential sites for new plant capacity that may be needed in the future to meet Florida customer needs, including sites in Citrus County. The energy complex’s four coal plants remain in service in Citrus County. “The Crystal River Nuclear Plant has been an important part of our generation fleet for three decades,” said Alex Glenn, state president, Progress Energy Florida. “We are very sensitive to the impact on our employees at the plant and on the Citrus County economy. “We are working to place as many employees affected by today’s announcement in other positions within the company, and we are committed to working with Citrus County to lessen the effects as much as possible,” he said. The company’s decision comes after a comprehensive, months-long engineering analysis of the damaged CR3 containment structure. The nuclear unit, which began operating in 1977, had been shut down in the fall of 2009 for refueling and replacement of its steam generators when a delamination, or crack, occurred in the outer layer of the containment building’s concrete wall. The process of repairing the damage and restoring the unit to service resulted in additional delaminations in other sections of the containment structure in 2011. During the ensuing months, Progress Energy – and, more recently, Duke Energy – evaluated the ability to successfully repair the unit, the risks associated with any repair and the repair scope as well as the likely costs and schedule. A report completed in late 2012 confirmed that repairing the plant was a viable option but that the nature and potential scope of repairs brought increased risks that could raise the cost dramatically and extend the schedule. NEIL coverage claims resolutionIn addition, the company and its insurance carrier, Nuclear Electric Insurance Limited (NEIL), have reached a resolution of the company’s coverage claims through a mediation process. Under the terms of the mediator’s proposal, NEIL will pay an additional $530 million. Along with the $305 million NEIL has already paid, customers will receive $835 million in insurance proceeds. This will be the largest claim payout in the history of NEIL. "We believe accepting the mediator’s proposal is in the overall best interests of our customers and shareholders, and the monies we receive will go directly to customers to reduce their electric bills," Rogers said. Timing and next stepsThe company is working to develop a comprehensive decommissioning plan. The plan will determine resource needs as well as the scope, schedule and other elements of the decommissioning. The company intends to use the SAFSTOR option for decommissioning. Generally, this involves placing the facility into a safe storage configuration, requiring limited staffing to monitor plant conditions, until the eventual dismantling and decontamination activities occur, usually in 40 to 60 years. Additional specifics about the decommissioning plan are being developed and will be provided in the future. Meeting customer needs As it has done through the extended outage, Progress Energy Florida will continue to serve customers reliably in the coming years through a combination of power generation, energy efficiency and purchasing power in the energy market. Meanwhile, the company is evaluating the potential to build a new, state-of-the-art, natural gas-fueled power plant, which could come online as early as 2018. There is no definitive plan for new generating capacity at this time. Approximately 600 full-time employees work at the Crystal River Nuclear Plant. Many will remain onsite to work through the closing and decommissioning of the unit. The company will work with employees to help as many as possible make the transition to positions in other Duke Energy organizations. The coal-fired units and employees are not affected by today’s announcement. As previously announced, the company expects to retire the two older coal-fired plants (units 1 and 2) in the coming years – most likely in the 2015-2018 time frame – due to changing federal regulations, but there is no specific retirement plan for the units today. The company has invested more than $1 billion in recent years in adding advanced emission controls on the newer coal-fired plants (Crystal River units 4 and 5) and plans to continue to operate those units for many years to meet customer electricity demands. Progress Energy FloridaProgress Energy Florida, a subsidiary of Duke Energy (NYSE: DUK), provides electricity and related services to more than 1.6 million customers in Florida. The company is headquartered in St. Petersburg, Fla., and serves a territory encompassing more than 20,000 square miles including the cities of St. Petersburg and Clearwater, as well as the Central Florida area surrounding Orlando. Progress Energy Florida is pursuing a balanced approach to meeting the future energy needs of the region. That balance includes increased energy-efficiency programs, investments in renewable energy technologies and a state-of-the-art electricity system. More information is available at www.progress-energy.com. Below is the translated text of a new press release from Electrabel / GDF Suez. Following the indications of defects due to hydrogen discovered last summer in the reactor vessel material Doel 3 and Tihange 2, Electrabel presented on December 5 a file of justification for the Federal Agency for Nuclear Control. In its communication of 15 January, the FANC has emphasized the important work and high quality achieved by the operator in this framework. The agency also noted that it saw no evidence to suggest that plants should be put to the final judgment. Before rendering its final decision on the restart, however, the Agency asked Electrabel information and additional tests. Requests by FANC relate in particular to conducting pressure testing of the primary circuit of Doel 3 and Tihange 2 as well as mechanical tests on materials. Electrabel has today submitted its action plan with a detailed schedule for approval by the supervisory authority. Electrabel will perform the tests with the utmost rigor. According to estimates, the tests would be completed before the end of March. The results will be submitted to the Agency. Electrabel recalls that the maximum safety of its facilities is the top priority in respect of the public, workers and the environment. See my post at ANS Nuclear Cafe for background on this situation. Click here to see the most recent previous APR post on this topic, including a press release from FANC. Today's Electrabel press release is a response to this request by FANC. Click here to view the original version of today's Electrabel press release in French. ROSEMEAD, Calif., Feb. 1, 2013 — Southern California Edison (SCE) has begun sharing its technical responses to requests for additional information from the Nuclear Regulatory Commission (NRC) as part of the ongoing thorough review of SCE’s repair, corrective actions and restart proposal for Unit 2 of the San Onofre Nuclear Generating Station. The responses will be posted at www.SONGScommunity.com as they are available. SCE’s restart analyses includes evaluations from independent international experts who completed more than 170,000 inspections to understand the tube wear issues and confirm the effectiveness of corrective actions. SCE’s proposal includes preventive tube plugging and operating Unit 2 at 70 percent power for a five-month period. A great deal of information has very recently been made available on this issue at the NRC's website as well. Click here to access this newly created page, covering presentations that will be made at an upcoming meeting. To see the SONGSCOMMUNITY.COM page covering the Confirmatory Action Letter, responses and supporting information, and NRC Requests for Additional Information, click here. Background information on Steam Generators. 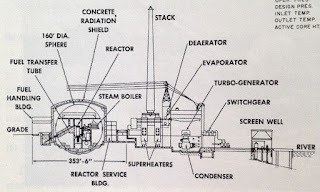 Previous and popular posts on Atomic Power Review have covered the design and construction of steam generators as a way of providing supporting information to the general public on the situation ongoing at San Onofre. Click here to read about what Steam Generators are and how they're designed and built. Click here to read a guest post here at APR from Meredith Angwin, covering her days of Steam Generator research and EPRI. Click here to see a previous APR post covering the NRC's agreement that design changes to the replacement units at San Onofre did comply with 10CFR50.59 requirements. Includes links to Confirmatory Action Letter and full NRC report.